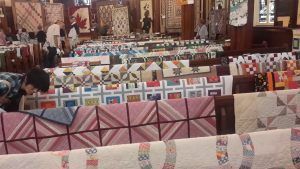 Usually visits to quilt shows are planned months in advance, but the unexpected give me much enjoyment. 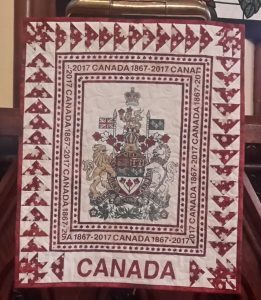 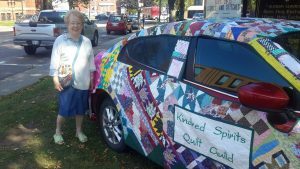 While visiting my sister in law in Prince Edward Island, Canada the local newspaper announced a quilt show to be held in St. Paul’s Church, Charlottetown starting the next day! 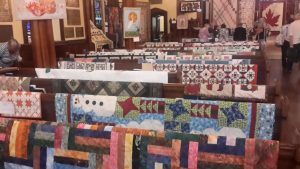 The church was just full of quilts – mostly traditional – all displayed over the pews and so easy to see in detail and labels on each gave the name of the quilter and a short description of the quilt. 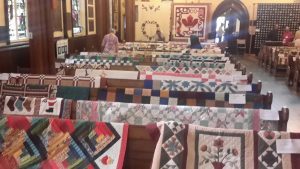 An added attraction was a visit to the church hall where over one hundred hooked cushions, rugs and wallhangings were on show……………busy, busy ladies who like to do handwork through the long snowy winters.